Houses & Homes VA: Controversy is what makes the Mayweather / Pacquiao fight worth watching! 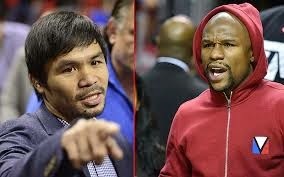 Controversy is what makes the Mayweather / Pacquiao fight worth watching! I’m not usually a big fan of boxing but I have to admit that even I’m getting excited about the upcoming fight! It seems that everybody is talking about the May 2nd brawl between the two champions and everybody is certain who the winner is going to be. The bout itself has almost become a controversy and I even heard a few people arguing about it. Both fighters have a huge fan base and both are credited with keeping the sport as popular as ever and raising the bar for other fighters. Part of the reason that the matchup is so exciting for boxing fans is the fact that Floyd Mayweather, Jr. has never lost a single fight in his professional boxing career. His record is perfect at 47 wins and 0 losses. Fans of Manny Pacquiao (affectionately known as “Pac Man”) want to see him be the one to put an end to Mayweather’s (often referred to as “Money”) perfect record. They feel that although Mr. “Money” is often referred to as “pound for pound” the best fighter in the world, that Pac Man is in fact the best and they want him to prove it. Mayweather fans, on the other hand, want to end the controversy with a decisive victory and see their fighter retire undefeated someday. Also of interest is the fact that boxing legend Rocky Marciano retired from the ring with a record of 49 wins and 0 losses way back in 1956. To this day no one has broken that record and if Mayweather can win 3 more fights, he will go down in sports history as the undefeated boxer with the most wins. Even this point is in dispute as some boxing fans feel that Marciano fought tougher fighters and deserves to remain the record holder. The truth is that everything about this upcoming contest is steeped in controversy. For one thing, it has taken 5 long years for the match up to finally take place. First, Mayweather refused to fight Pacquiao citing that the vast majority of the money should come to him and not be split equally between both fighters. Many people felt that this was an excuse and that he was fearful of ruining his perfect record. Then there were the insults being hurled between both camps. Pac Man was accused of using illegal drugs by Mayweather at one point and was even referred to as a “midget”. All of this was just the beginning of some very unfriendly words between the two camps. That is why this bout is so exciting to so many people, it is personal and not just another over glorified boxing match. Manny Pacquiao is one of the most beloved boxers in history and is a national hero in his country of birth, the Philippines. He is considered the “nice guy” of boxing even by most Americans and is quite the opposite of Mayweather. Floyd is often referred to as one of the “bad boys” of the sport and his out of the ring antics and boisterous attitude is a big part of the reason. Both men are truly opposites and everyone seems to love one and hate the other. And that makes for great boxing! I have a favorite as well as my very own prediction but I’m not going to share it with anyone, at least not yet! I don’t want to hear how wrong I am from the other guy’s fans but one thing is for sure; these two men are without a doubt boxing legends and both have earned it. Their skill in the ring is amazing and even if you are not a fan of the sport you have to take your hat off to them for what both of them have accomplished. Yes, I do hope my fighter wins but more importantly, I hope that no one gets hurt and everyone enjoys the show!